Since back in 1977, every year numerous cross-country ski enthusiasts meet to improve their times at the Cross-country skiing marathon Toblach-Cortina, which is held on the first weekend in February and is one of the events that no cross-country skier wants to miss. 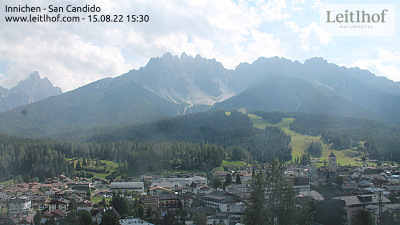 They cover the distance between Toblach, the gateway to the Dolomites, and Cortina, the “Queen of Ampezzo”, following the old railway track built during the First World War and abandoned in 1956, after the Winter Olympic Games were held in the famous resort. An event launched more recently but which in the meantime has risen to the top ranking for cross-country skiing events in South Tyrol, second only to the Marcialonga in Italy for number of participants, is the Cross-country skiing marathon of the Gsieser Tal, held on the third weekend in February in the splendid side valley in the Hochpustertal. Each year about 2,300 athletes of both sexes take their marks for the 30 and 42 km races in both classic and skating style, which are valid for the Euroloppet, the “Gran Fondo Mastertour” and the Italian Ranking. An opportunity also for the less ambitious, who can take part in the competition “just for fun” on cross-country skis and snowshoes, simply enjoying the wonderful valley landscape in the company of many other people who share the same passion. At the Poloclub Valcastello in Innichen/San Candido it is possible to play polo from December to March. Also in the summer polo players have the possibility to practice this sport. There fight two teams of three players against each other. The polo arena field misures 110 metres * 60 metres and it is rentable. The month of February is traditionally characterised by the Carnival period. In olden days in South Tyrol they impatiently awaited the joyful arrival of spring, which brought an end to a cold and difficult period. The inhabitants of the various villages would gather in noisy parades to drive out the dreaded winter and snow with shouting, din and fantastic masks. Although today Carnival is no longer dedicated to casting out the demons of winter but only to having a good time, in many places in South Tyrol the old customs have been kept alive, such as the parades of decorated floats at Innichen, Sexten and Toblach. Here at the Leitlhof Shrove Monday is devoted to Carnival, with music and a masked party. Our beauticians will teach you original ways to make up your children. We look forward to receiving your non-binding request.